This week's Free GM Resource is a great little magazine dedicated to "filling the gaps" for old school gamers. & Magazine is a little gem that had completely flown under my radar until recently, which is good only for the simple fact that there is a lot of catch-up for me to do now. 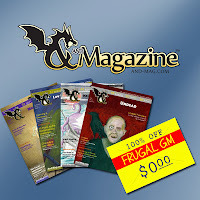 They are up to issue #5 and there are also a couple of supplements and adventures as well. Really not bad at all figuring this magazine started a year ago. When I saw these two titles/subtitles I knew I was going to enjoy reading this and I haven't been disappointed yet. I've already found several things I'd like to use in my game and I think a GM would be hard-pressed to walk away from an issue empty-handed. You should check out & Magazine today.